Christmas is only 13 weeks away. And judging by how fast time seems to go you know that Christmas is going to be here before you know it. Even the big box stores are trying to remind us of Christmas earlier and earlier each year. I saw a whole Christmas tree display at the store yesterday! Don’t think I’m trying to get you to open your wallets and dish out tons of extra money in the name of Christmas like the stores do. I actually want to do the exact opposite. Instead of running out and overspending on a bunch of junk, let’s take a smarter approach. If you can save $500 by Christmas and then wisely spend it, you should be able to get awesome gifts for everyone on your list! Here’s an easy calculation. Divide $500 by 13 weeks. You get $38.40. So for simplicities sake I rounded that number to $40. All you have to do to get to that $500 mark is save $40 per week. I know sometimes that’s easier said than done. Maybe you can’t save $40 each and every week. If so just put back what you can manage without abandoning your other, more important financial obligations. 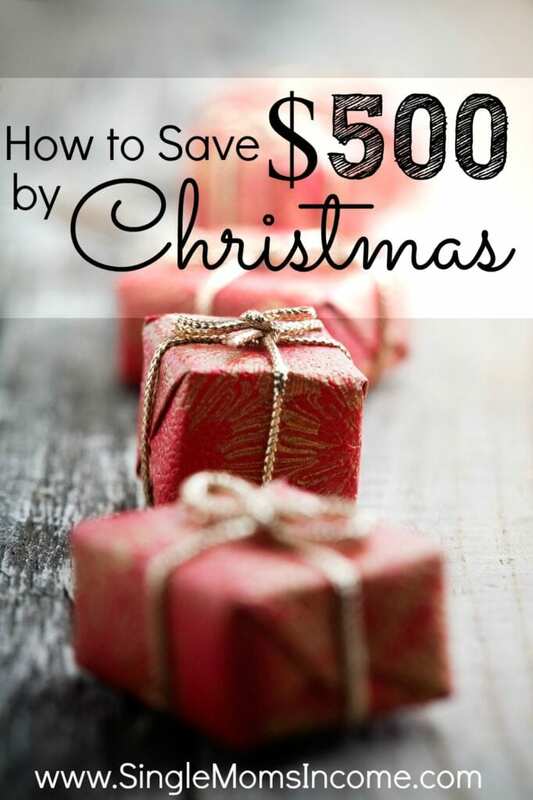 If saving $500 by the time Christmas rolls around still feels out of reach here are some creative ideas to help. Hands down, the easiest way to make easy extra cash is by getting rid of your old stuff. I had a yard sale earlier this year and made a few hundred dollars by doing hardly anything. I thought I had gotten rid of my junk but I really hadn’t. I’ve since went through my closet and halved it again. The girls also have way, way too many books. I need to go through these and get rid of all the ones they’ve outgrown or have no interest in. If it’s been awhile since you went through and got rid of your stuff, do it now. Try listing it on Facebook Yardsales. You’ll eliminate your clutter, make room for future Christmas stuff, and earn you some shopping money to boot. Seriously, there’s no easier way to make extra money. Have you ever watched Extreme Cheapskates? If so you know that the show is usually bogus. I mean is eating out of the dumpster really worth saving money? I think not. But to give the show a little teensy bit of credit there was one idea I liked: a financial fast. Basically what you do is pick a certain amount of time, say a week or a month, and vow to not spend money. You use what you have. You get creative – eat out of the pantry, find free entertainment, don’t buy yourself or your kids anything that you don’t need to live. If you could commit to a one month financial fast I think you should be able to save around $100, if not more. Usually right around October Capital One 360 (formerly ING Direct) has a promotion where you can earn $150 in free money. And yes it is totally free!! Here’s how it works: Capital One 360 will give its affiliates (I’m NOT an affiliate) special links where their readers can sign up for new accounts and earn bonuses. There’s usually a bonus for opening up a free checking account and making three purchases via a debit card. After so many days (usually 50) your bonus gets credited to your account. There are also different bonuses for putting certain amounts of money into savings account. Everything I’ve listed so far, except for the financial fast, has been an easy way to earn extra money. So is Inbox Dollars. You can also do some of your regular internet searches to earn more money. But the real money comes from trying out the free offers. 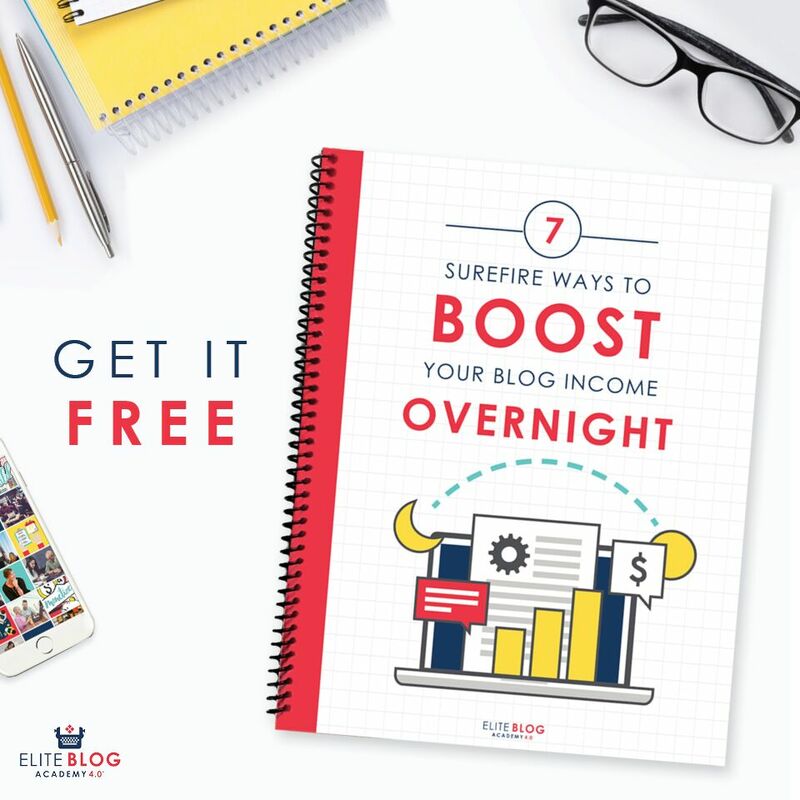 I do the free ones – like credit karma, signing up for survey sites, and if I’m interested in a financial product, like a credit card, I check inbox dollars first. I actually earned $15 for signing up for the Discover IT credit card last year. Pretty easy. The only two survey sites you ever see me mention are Inbox Dollars and Swagbucks. And that’s because I’ve tried a TON of these types of sites and these are the only two that made the cut for me. Similar to Inbox Dollars, Swagbucks is a site that rewards you for searching the web, taking surveys, and completing offers. You can also refer your friends and family to earn 10% of the points that they earn through Swagbucks. (And yes, I’m using my referral code.) But if you don’t feel comfortable signing up through me no hard feelings! You’re not going to make a living with Swagbucks. But if you spend a couple minutes on Swagbucks every day and use their search engine you can easily earn $30 in gift cards by Christmas. There are obviously more things that you can do to earn that $500 (like work overtime, do some freelance work, or use some other type of survey site.) The things listed are the tasks that I personally do to earn some extra cash when needed. Start working on putting that $40 a week away and in future posts we can share ideas about making that budget stretch as far as possible! 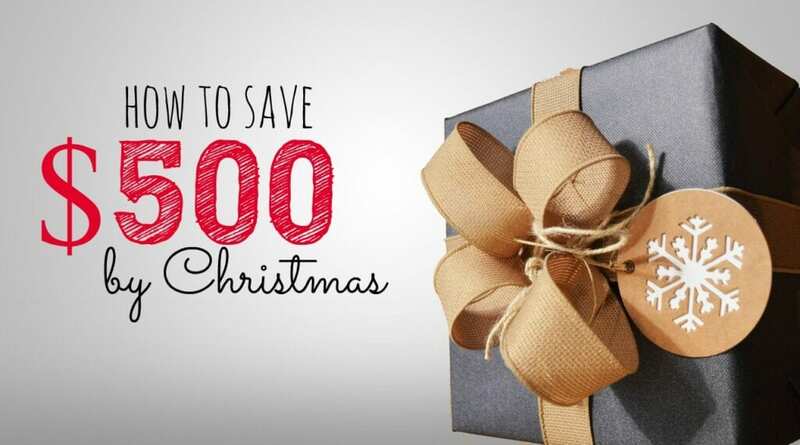 What other ideas do you have for saving $500 by Christmas? Oh no Christmas is coming up soon! Good reminder. I like your suggestions. I used to use the bank account promotions all the time to get an extra $200-$300 into my Christmas budget. It’s so easy. Paid surveys also work pretty nicely too. LOVE this challenge Alexis! I’m in! I recently wrote about Swagbucks too and I think it can be a good way to grind your way to some free $. At the very least $500 would offset the Christmas presents and other holiday expenses. Also, great to be back at your blog. I haven’t stopped by in a while and I was happy to see you comment on mine. I actually changed my commenting strategy and don’t actively comment and only reciprocate other commenters. Does that make sense? If you have any other good ideas of how to cut down on the time spent commenting – besides quitting altogether – let me know. The last two years we have bought our daughters presents used online. I know we are the worst! Actually she wanted some my little ponies and at the store they were $6 each. We checked it out on the local internet sellers and we found a family getting rid of their daughters collection for $25. We picked up 50 ponies for $25 and out daughter was in heaven. Now the only problem is having so many my little ponies all over the place. We did the same thing last year for “littlest pet shops” and success. Someone is always clearing out old stuff that is new to someone else and much cheaper. Always good to plan now. I got burned last year on the amazon/ups shipping problems and only gave my wife pictures of her presents….not so great. Nothing wrong with that at all. We have a buy and sell site at work. I picked up a ipod speaker shaped like a dog for my daughter. She loved it and never asked to see a receipt (she was 7). This year I am looking for a second hand fitbit for her. Lots on line still in package or gently used. hahhahaha… comment of the day right there. I am listing as much as I can on ebay in order to earn money for Christmas! I haven’t checked out swag bucks yet. Just worried about another time sucker;0) $500 is a great goal! I pay a visit everyday some blogs and websites to read content, but this web site gives feature based posts. I love your blog. I discovered it maybe two days ago via Pinterest. I ADORE Swagbucks, but since you’ve written this post, a $5 Amazong GC is now 500 points, not 450. But, in some ways it is also easier than ever to earn through them. I’m averaging $20 to $30/month in Amazon credit from Swagbucks and usually another $5 for a Starbucks gift card. I just save up the credit over the course of the year and use it to buy my son’s birthday and Christmas presents. I’m working at selling stuff I don’t want/need/use ~ seems like every time I feel like I’ve sold the last thing that I could possibly part with, I find several more! One of the easiest ways I’ve found recently is to find a closed Facebook “yard sale” group for my suburb/neighborhood. Super simple and doesn’t require a whole yard/garage sale which is great since I live in an apartment. I swear the next Christmas season starts on December 26th these days!